Host Hannah Simone attends the WE Day Celebration Dinner at The Beverly Hilton Hotel on April 6, 2016 in Beverly Hills, California. 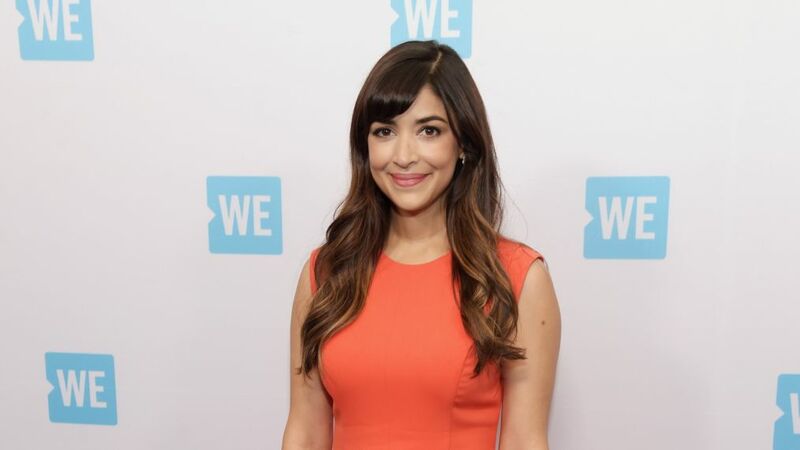 Hannah Simone is just as sensible about her finances in real life as her character, Cece, is on Fox's hit series New Girl. "I like to maximize my dollar," Simone admits while promoting Straight Talk Wireless' new saving plan. "I try to find really fun and functional ways to spend my money. With Straight Talk there are no mystery fees, no contracts." Cece would definitely be taking advantage of this prepaid wireless plan. In the Season 6 finale, we saw the former model-turned-businesswoman balancing her growing modeling agency while expecting her first child with TV husband and funnyman Schmidt (Max Greenfield) and renovating their new home. Just a little busy. The 2018 reboot reverses the lead's gender role. When the series returns for its seventh and final season on April 10, the show's timeline jumps four years ahead. Simone teases that fans can expect the loft roommates to be at different points in their lives, with big decisions still to come but they'll always having each other's backs. And, of course, more pranks are to come. Where does the final season take the characters? Hannah Simone: What's really exciting is that they did a time jump about four years into the future. Our showrunner and our team of writers were like, "Well, let's just give [fans] a glimpse and see what happens to everybody." It's a reboot instead of a final season. As fans of the show ourselves, we got to see where Cece and Schmidt ended up, where Nick and Jess ended up, and Winston and Ally. It was really fun to play and watch how our characters have grown. What's Cece been up to, specifically? She runs her own business now. And Schmidt loves being a stay-at-home dad. We do a really great episode where he tries to go back to work, which is a real battle, and they have work through that together as a family. I think parents will really like watching that episode. Every [character] got their moment with each other. We did a really great Cece-Winston "mess around," and you get to see the origin of the "mess around." I think that's going to be an episode that fans are really going to love. Are there flashbacks to any time in the four-year period that has passed? I'm going to give you a hard "probably." Do any of the other couples get married? Will we see a wedding at some point? [Laughs] I hate spoilers! It's a good possibility. Which returning guest stars were you most excited about? All of them came back, and all of them were the best, and everyday I was excited. I was fan-girling every single day on set. It was amazing to see the people that would come back and be part of the finale season. That was one of the best parts; it was like a a farewell tour on our set. That was really emotional, too. What do you hope fans take away from the final season? I hope they're just happy. I hope it feels like a good, proper goodbye, because [the fans] deserve it. We have the best fans, and this final season is all for them. For them to be able to see Cece and Schmidt as parents, to see the origin of the mess around, [and] of course True American. Fans wanted to see a final game of True American. I hope they enjoy it and all that they wanted is right there in those eight [final] episodes. The reboot of The Greatest American Hero is your new pilot show. Talk to me about the character. It used to be a male high-school teacher, and now it's this woman named Meera who is just trying to pull her life together. It's so funny and relatable and honest. I just love this character so much. And as far as I know, it's the first time a woman of color will play a superhero on TV, so that's so exciting to be a part of. I didn't grow up seeing anyone who looked like me playing a superhero. So the fact that I'm part of this shifting landscape of representation feels really exciting. Every single action of representation matters and creates more opportunity. Do you like all the revivals and reboots coming back to TV? I'm a creature of habit, of comfort. So for me, it's wonderful [that] all the reboots [are] coming back, because I know the world, but it's so exciting to see everything adapted into today's world. I love Crashing. They have amazing cameos.